AMERIKICK THROWS AWESOME KIDS PHILADELPHIA BIRTHDAY PARTIES! Whether it’s summertime or anytime, there’s simply no better place that AmeriKick in all of Philadelphia to hold your child’s next birthday party. For two action-packed hours, all of your child’s friends will have an amazing time with our kids Philadelphia Birthday Parties. Thanks to our fun-loving and enthusiastic Philadelphia Birthday Party Karate instructors, we’ll have your child and up to 25 friends running, kicking, and jumping their way to kids Philadelphia Birthday Parties that just can’t be beat! We're happy to customize your birthday party to meet the unique needs of your group. Check out our add-ons or feel free to give us a call to learn more about our party packages! DON'T HESITATE - RESERVE YOUR MARTIAL ARTS BIRTHDAY PARTY TODAY! 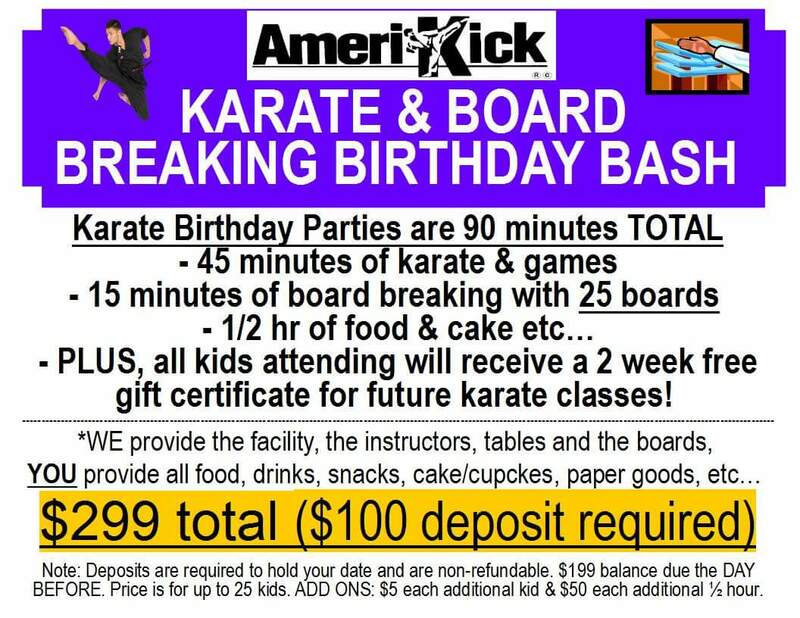 Our Birthday Parties at AmeriKick Martial Arts fill up fast! So don't wait until it's too late. Book the best Birthday Party in Northeast Philly today by filling out the short form on your screen. A member of our staff will reach out soon to answer all of your questions and get your party all set up!